With a new year in full gear, we know that it will be filled with exciting new projects, milestones, partnerships and much more! Last year, our impact could be felt in a tremendous way as we distributed baby clothing, formula, diapers, winter coats, clothing, household items, toys and more. In addition, we provided hundreds of personal hygiene kits and distributed more than 1,000 backpacks filled with school supplies, tens of thousands of cases of food and over 100,000 PB&J sandwiches across numerous corporate-sponsored PB&J Days (#StFFPxPBJ). We kicked off January by hosting an "Annual Dinner for the Needy" at the Church of St. John the Baptist in Manhattan, near Penn Station. On this occasion all were welcome to come enjoy a free meal and an afternoon of fellowship. 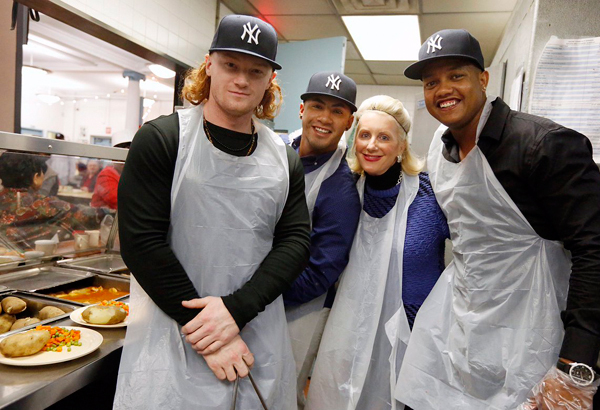 This same month, familiar faces from the New York Yankees visited a local senior center that we help and spent the day serving meals and connecting with lively guests. Colgate-Palmolive employees prepared thousands of personal care kits, filled with vital items that can be a bit of a financial burden, for families who tow the poverty line. When cold weather strikes one of the most important donations we can receive is that of winter coats and accessories. This, coupled with contributions of toys for our youngest clients, truly lightens the load of the families who rely on us so much. Monthly Ross Stores donations are something that we have come to depend on receiving and being able to pass on to our clients. While our clients are always at the heart of what we do, our supporters make it all possible. Thank you all for your commitment to our mission. Be sure to show your support on social media by using our hashtags: #StFFP, #DoodleForHunger and #SpinForHunger.